It’s turning out to be a good year for Lillian Hellman’s Hubbard family. This fall, The Little Foxes – the 1939 play that made them famous – is getting a production at the New York Theatre Workshop. Another Part of the Forest, Hellman’s 1946 prequel about the greedy Alabama brood, just had a revival at the Peccadillo Theatre Company. And in between, here comes the third jewel of the triple crown. 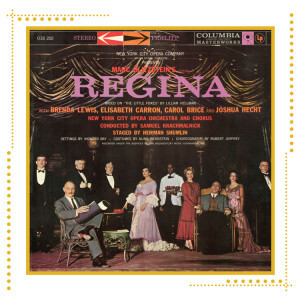 It’s a reissue of the recording of the 1958 New York City Opera revival of Regina — Marc Blitzstein’s 1949 opera of The Little Foxes, for digital download and disc-on-demand through Arkivmusic.com. And even though Robert Garland of the Journal-American proclaimed, “During many a year of first-nighting, few first nights have provided the unlooked-for excitement and satisfaction of last night’s first night,” Regina couldn’t rack up nearly enough nights to be a hit. After fifty-six performances, it closed. When the time came for Tony Awards® to be dispensed, Regina did get two, but they were “only” for costume designer Aline Bernstine and conductor/musical director Maurice Abravanel. In the other musical categories, South Pacific won most every other Tony®. For almost a decade, the only way to revisit Blitzstein’s work was to get hold of an acetate on which Blitzstein played piano while original cast members Jane Pickens (Regina Hubbard Giddens), Brenda Lewis (her sister-in-law Birdie) and a few others sang a few songs. But not until the 1958 airing at City Center – for a mere three performances – did Regina get its chance to be (almost) fully recorded. Now many more had the opportunity to be astonished at Blitzstein’s range – especially those who had heard his dissonant and agitprop The Cradle Will Rock in 1937. Could this possibly be the same composer who came up with these bolt-of-lighting melodies on such a broad and beautiful musical canvas? One can see why Blitzstein would be attracted to The Little Foxes, given that, like Cradle, it too deals with capitalism. While Cradle’s main villain was Mister Mister, here we have Messrs. Messrs. — Ben and Oscar Hubbard, who are looking to clean up through a new cotton factory and pay townspeople atrociously low wages. And then there’s one Ms. Mister – Regina, their sister, who’s more ferocious than both of them. She’ll stop at nothing to get a larger share (and eventually a controlling interest). In an interview released on Spoken Arts Records in 1956, Blitzstein said that Regina “falls into a category known in France as opera comique.” Lest the story of the Hubbards’ manipulating, lying, stealing, cheating and playing one against the other not sound so comic, remember that the term “opera comique” actually means a work that contains spoken dialogue and/or recitatives in addition to arias. Regina sure does. After a prologue that segues from allegro maestoso (majestically joyous) to allargando e ritenuto (still majestic, but getting slower and holding back) to tranquillo (calm), the Hubbards’ servants Addie (Carol Brice) and Cal (Andrew Frierson) get the first ragtime of the piece – even if the music is marked rag grazioso (graceful). Brenda Lewis, who’d been promoted from Birdie in the original to Regina here, will soon open the window and complain that they’re making “a racket.” But it’s music to most of our ears. The most acclaimed piece of all is “Birdie’s Aria,” here sung by Elisabeth Carron to Alexandra (Helen Strine), her niece and Regina’s daughter. Here’s where Birdie confesses that those “headaches” that have often excused her behavior aren’t true; sheer drinking has been responsible. Birdie ruminates on her youthful happy days at Lionnet, the mansion and plantation her family once owned, before Oscar married her for it, and he and Ben took it over. She also warns Alexandra that a similar sad fate could well befall her. Blitzstein sure tried. He not only included jazz, but also created a character called Jazz. Blues was involved in a scene in which Addie tried to comfort Birdie. Even a good ol’ fashioned Broadway show song was in evidence, courtesy of Alexandra’s “What Would It Be?” At Regina’s party, there was a polka and a swirling waltz. (The latter involves a character not in The Little Foxes, but in Another Part of the Forest: John Bagtry, Birdie’s brother and once Regina’s suitor.) “Away to Get Away” was a stirring aria in which Regina told about the joys of travel, encouraging Alexandra to go to Baltimore – for her own venal reasons, of course. Arguably most beautiful of all was “The Rain Quartet,” in which Alexandra, her father Horace, along with Birdie and Addie, ruminated on the weather before they got into more philosophical matters. Finally, the servants had the last word through a spiritual. Those who know Handel’s work may feel some influence in the recitatives. Listeners familiar with Alban Berg’s sprechstimme will be reminded when they hear pitches that are approximate rather than exact. And as if writing an entire score wasn’t enough, Blitzstein did his own orchestrations, too. Early in the show, Birdie mused about her culturally aware parents, and that they went “all the way to Europe just to listen to music!” Luckily, Regina is at last much closer to us than that.